If you love playing billiards, then Russian Pyramid Pool will get your blood pumping for sure! Russian Pyramid is a billiard game that is completely different from the many game variations of billiards. For one, special equipment is used to play Russian Pool. Sorry folks, but the usual billiard accessories you have just won’t cut it for this one. Don’t discard the idea just yet though, you might just fall in love with this unique game the more you get to know it. 1 What is Russian Pyramid? Shown in the photo is the set up of the balls in Russian Pool. The main difference to tradictional pool, as you can see, is that all balls are white colored. Russian pyramid is also known as Russian billiard or pyramid billiards. It is a cue sport that has a few major differences from Western pool. Although the objective of the game is still the same – pocket some billiard balls. It is played in Russia and all other countries from what once was the Soviet Union. Table: Playing-surface sizes vary. The usual range (the foot measurements are traditional approximations, the metric more precise) include: 7 × 3.5 foot (198 × 99 cm); 8 × 4 ft (224 × 112 cm); 9 × 4.5 ft (254 × 127 cm); 10 ×5 ft (295 × 147 cm); up to 12 × 6 ft (355 × 177.5 cm) – the official tournament size is the 12 ft model, the same size preferred for snooker, but much larger than a pool table (7 ft and 9 ft being the most common sizes for that style of game). Balls: There are sixteen balls (fifteen numbered, plus a cue ball), as in pool, but the numbered one are white, and the cue ball is usually red. Up to 70 millimetres (2 3⁄4inches) in diameter, they are larger and heavier than Western billiard balls; the official tournament size is 68 mm (2 11⁄16 in). Smaller balls – e.g., 63 mm (2 1⁄2 in), 60 mm (2 3⁄8 in), and 57 millimetres (2 1⁄4 in) – are available for the smaller table sizes. Pockets: The corner pockets are only 4–5 mm (approx. 3⁄16 in) wider than the diameter of the ball. The central pockets, however, are 14–18 mm (approx. 1⁄2– 3⁄4 in) wider than the diameter of the ball. This makes the game's mechanics like an oversized version of snooker, requiring greater precision to pocket a ball in such tight pockets than in pool, which has a much larger pocket size in relation to the balls. As I have already mentioned, the objective of pyramid billiards is just the same as regular billiards. And that is to pot balls into holes. What makes Russian pyramid pool extra challenging though is the size of the pockets and the balls. 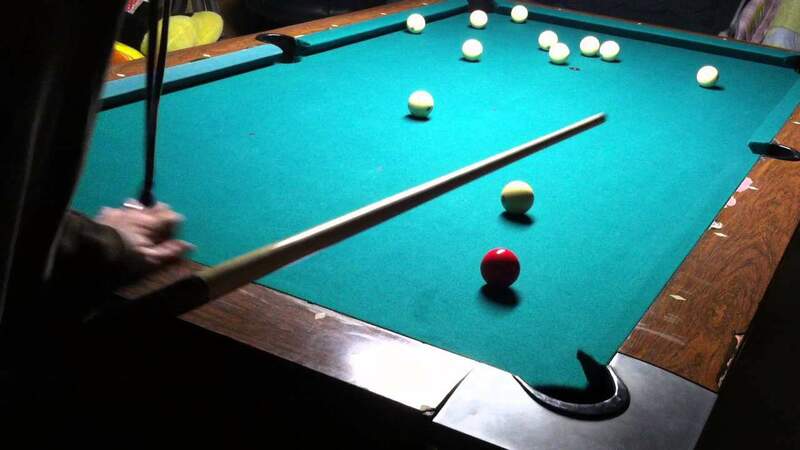 Russian pool has balls that are almost just of the exact size of the table used for the game. So it’s practically a game of extra precision. Seen in the photo is a game of Russian Pyramid Pool in action. There are different variations to Russian pyramid pool, all of which are listed below. Free Pyramid – also known as American pyramid. 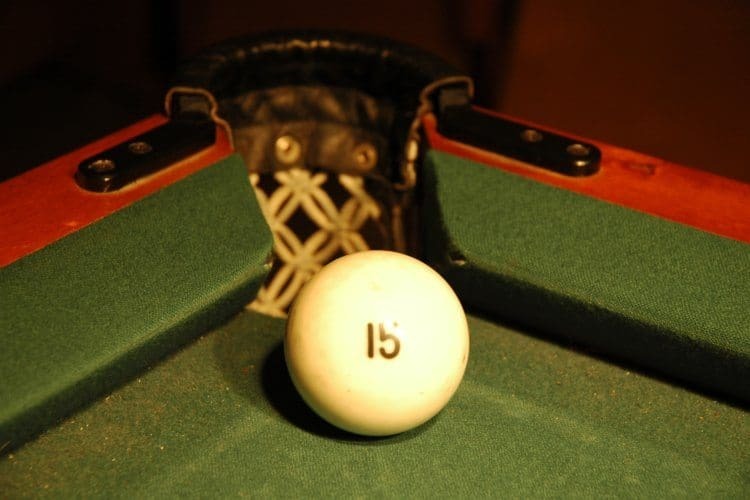 The rule of this game varies in such a way that any ball may be used as a cue ball at any given point in the game. Players may only pocket a ball they struck if it hits another ball first in the process. The goal is to carom (cannon) the shot ball to one more balls into a pocket. Dynamic pyramid – also known as Siberian pyramid or Nevsky pyramid. In this game, only one of the balls is a cue ball. Players need to pocket the cue ball with a carom shot off another ball and then the player must choose a white ball to be taken off the table. The player then has the cue ball in-hand and may place it anywhere on the pool table. However, he/she may not pocket until the next stroke. Combined pyramid – also known as Moscow pyramid. This variation is like the dynamic pyramid too only with a few differences. For the similarities, only one ball is the cue ball. Also, players need to pocket the cue ball with a carom shot off another ball and then the player must choose a white ball to be taken off the table. After so, the player places the cue ball between the head rail (bottom cushion) and head/baulk, but not on top of the line. In Western pool, this part of the table is referred to as the kitchen. From here, balls may only be pocketed in the side and far-corner pockets. This may seem a bit overwhelming at the beginning. But with much practice you will definitely be more familiar with the game. And I guarantee that you will enjoy! The best part of playing Russian Pyramid Billiards is that, you get to explore with a new table and set of pool balls. This will be a challenging and addictive game to all billiard enthusiasts out there.